I hate being hungry. I can’t concentrate and I’m really grouchy. Imagine if you were a kid who was hungry all summer. But here in Pittsburgh, that’s not an imaginary thing. It’s real. In fact, there are more than 45,000 children in Allegheny County that are considered to be food insecure, and 73,500 children are eligible for free or reduced-rate school lunches or breakfasts. So when Chris from the Southwest PA Food Security Partnership approached me and my friend Kathy about helping more kids take advantage of the summer food programs in our area, both of us said YES. Kathy and I had tables next to each other at the 2015 Farm to Table conference, but we’re also both members of the Society of Children’s Book Writers and Illustrators. 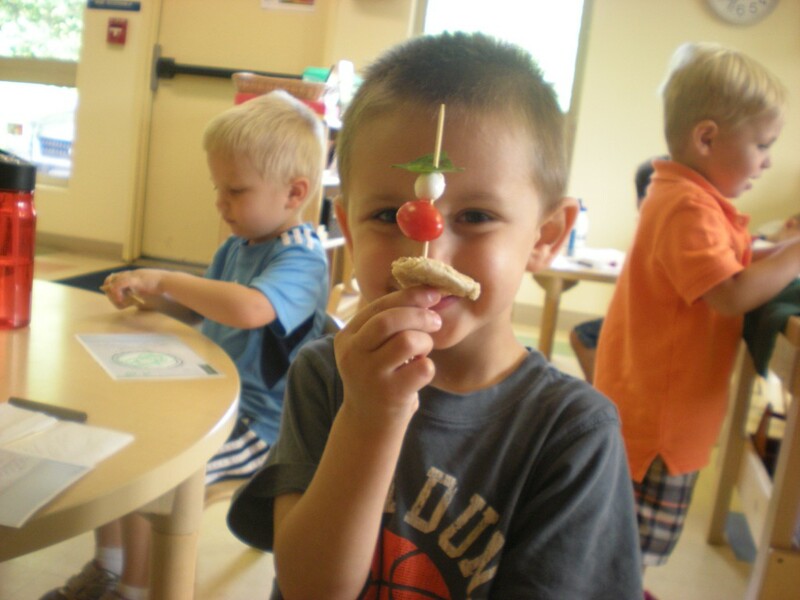 Chris loved the activities we were offering for children that centered around healthy eating but also had a literary and storytelling component. We met in early summer 2015 and he asked us if we could come to summer food sites and provide fun activities for the kids. He hoped that by advertising visits from local authors kids would be more interested in attending. 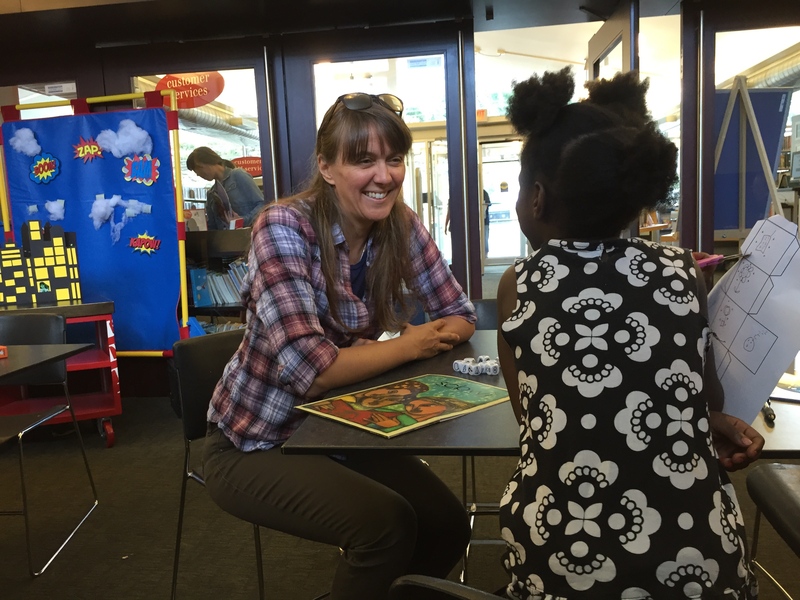 Kathy and I loved the idea and both realized this was a chance to interact with children (something kids’ authors love) and a chance to feed their minds and their bodies. But we like to think big. 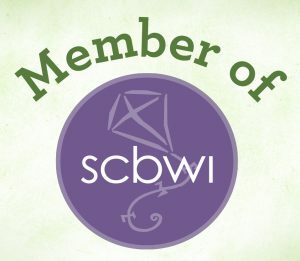 So Kathy and I invited all the members of SCWBI Western PA to join us. We had 14 volunteers sign up and they conducted over 10 visits in Allegheny, Somerset and Cambria counties. 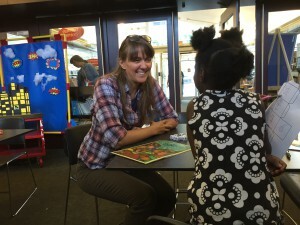 SCBWI volunteers read books, played games, and told stories while children enjoyed healthy, free meals. I took my youngest son with me to two of my visits to my old home library, Carnegie Library Woods Run. I used to walk to that library with my young children and we spent many happy afternoons in the children’s section. When my son and I visited in August we found a welcoming staff and adorable kids with incredible imaginations. For my visit, I brought copies of my book The Bumpy, Grumpy Road to share with the kids. I wanted give them something, a small gift to spark their imaginations. They gave me gifts, too, because in addition to reading stories we played StoryCubes and made up our own stories. And these kids were AMAZING! The little girl in the photo above and another little boy came up with an incredible tale about a boy who had the shadow of a beetle and a beetle who had the shadow of a boy. They traveled together to a castle where they discovered human king…but a beetle queen. You’ll have to use your imagination to find out what happens next. We definitely plan to continue this partnership next summer so if you’re a local Pittsburgh author or illustrator get in touch and help us feed imaginations while kids get fed. Maybe on a list like this someday! It can be tough to find the right books for 11 year olds. I am not an 11 year old, but I remember what books I loved reading when I was 11. My oldest son just turned 10 and I exchange emails with an 11 year old boy about books. 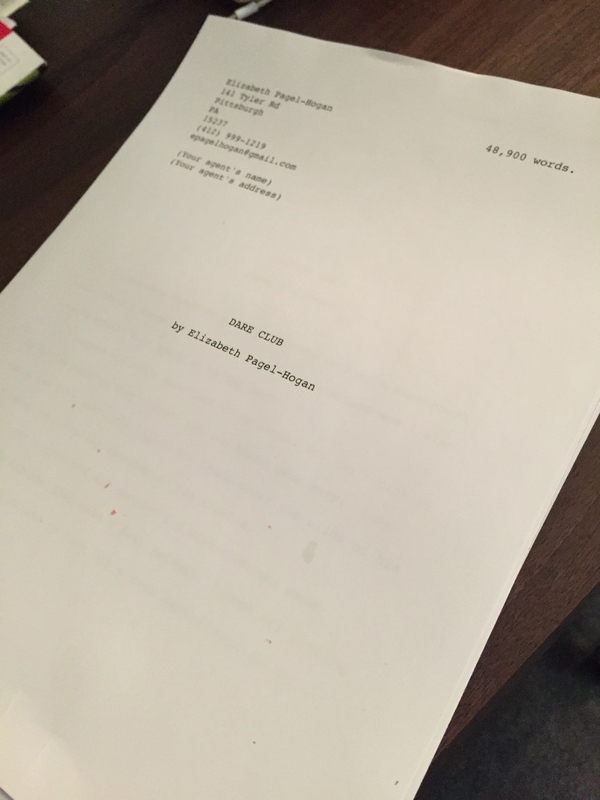 I am writing books and stories that I hope 11 year old boys and girls would want to read. That’s why I love this list from several well-known authors about books for 11 year olds. The list originally appeared in The Guardian, but I’m sharing it here and keeping track of what books I’ve read. What better way to write books for 11 year olds than to read great books for 11 year olds? I’ve still got quite a lot to read, but I’m making my way through the list. Have you read any on this list? Which are your favorites? READ * Alice’s Adventures in Wonderland and Through the Looking Glass by Lewis Carroll. Indispensable. The great classic beginning of English children’s literature. READ 2014 * Pinocchio by Carlo Collodi. What effortless invention looks like. READ 2014* Emil and the Detectives by Erich Kastner. A great political story: democracy in action. READ 2014 * Swallows and Amazons by Arthur Ransome. As clear and pure as Mozart. READ 2014* Black Hearts in Battersea by Joan Aiken. If Ransome was Mozart, Aiken was Rossini. Unforced effervescence. READ 2014* The Owl Service by Alan Garner. Showed how children’s literature could sound dark and troubling chords. READ 2013 * The Phantom Tollbooth by Norton Juster. Superb wit and vigorous invention. READ 2014* Moominsummer Madness by Tove Jansson. Any of the Moomin books would supply the same strange light Nordic magic. READ 2014 * A Hundred Million Francs by Paul Berna. A particular favourite of mine, as much for Richard Kennedy’s delicate illustrations (in the English edition) as for the story. * The Castafiore Emerald by Hergé. Three generations of this family have loved Tintin. Perfect timing, perfect narrative tact and command, blissfully funny. READ 2014* The Star of Kazan by Eva Ibbotson. The heroine is blessed with such wonderful friends who help her through the twists and turns of this incredible journey. READ 2014 * A Christmas Carol by Charles Dickens. The first few pages were so engaging, Marley’s ghostly face on the knocker of Scrooge’s door still gives me the shivers. READ 2015 * Just William books by Richmal Crompton. 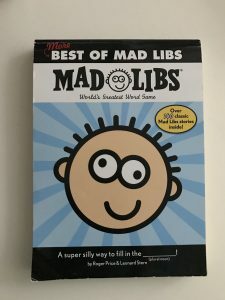 These are a must for every child. READ 2014 * The Happy Prince by Oscar Wilde. This was the first story, I think, that ever made me cry and it still has the power to make me cry. READ 2013 * The Elephant’s Child From The Just So Stories by Rudyard Kipling. The story my mother used to read me most often, because I asked for it again and again. I loved the sheer fun of it, the music and the rhythm of the words. It was subversive too. Still my favourite story. READ 2013* Treasure Island by R.L. Stevenson This was the first real book I read for myself. I lived this book as I read it. * The Old Man and the Sea by Ernest Hemingway. A classic tale of man versus nature. I wish I’d written this. * The Man Who Planted Trees by Jean Giono. A book for children from 8 to 80. I love the humanity of this story and how one man’s efforts can change the future for so many. * The Singing Tree by Kate Seredy The story of two children who go to find their father who has been listed missing in the trenches of the First World War. READ * The Secret Garden by Frances Hodgson-Burnett. I love this story of a girl’s life being changed by nature. * Refugee Boy by Benjamin Zephaniah. Story of a young Ethiopian boy, whose parents abandon him in London to save his life. * Finn Family Moomintroll (and the other Moomin books) by Tove Jansson. A fantasy series for small children that introduces bigger ones to ideas of adventure, dealing with fear, understanding character and tolerating difference. READ 2013 * Diary of a Wimpy Kid by Jeff Kinney. It’s rude, it’s funny and it will chime with every 11-year-old who’s ever started a new school. * I Capture the Castle by Dodie Smith. Written for a teenage audience but fun at any age. READ * The Hobbit and The Lord of the Rings by JRR Tolkein. Be warned, these tales of hobbits, elves and Middle Earth are dangerously addictive. * The Tygrine Cat (and The Tygrine Cat on the Run) by Inbali Iserles. If your parents keep going on at you to read Tarka the Otter, The Sheep-Pig and other animal fantasies, do – they’re great books – also try Iserles’ stories about a cat seeking his destiny. * Carry On, Jeeves by PG Wodehouse. A grown-up book – but not that grown-up. 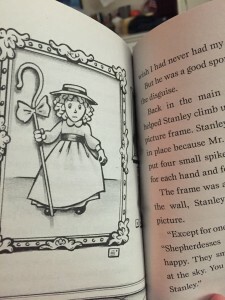 READ 2015 * When Hitler Stole Pink Rabbit by Judith Kerr. Judith Kerr’s semi-autobiographical story of a family fleeing the Nazis in 1933. * Moving Pictures by Terry Pratchett. Elaborate mythological imagery and a background based in real science. If you like this, the Discworld series offers plenty more. * The Story of Tracy Beaker by Jacqueline Wilson. The pinnacle of the wonderful Jacqueline Wilson’s brilliant and enormous output. * The Adventures of Sherlock Holmes by Sir Arthur Conan Doyle. Irresistible puzzle-solving tales of the chilly Victorian master-sleuth and his dim medical sidekick. * The Curious Incident of the Dog in the Night-Time by Mark Haddon. Age-transcending tale, both funny and sad. * Mistress Masham’s Repose by TH White. Magical story of 10-year-old Maria, living in a derelict stately home, shy, lonely and under threat from both her governess and her rascally guardian. READ * Little Women by Louisa May Alcott. Inexplicably evergreen, trend and taste-defying 1868 classic. * How to be Topp by Geoffrey Willams and Ronald Searle. Side-splitting satire on skool, oiks, teechers, fules, bulies, swots. READ 2015 * Stormbreaker by Anthony Horowitz. First of the action-packed adventures with 14-year-old Alex Rider. * Private Peaceful by Michael Morpurgo. “Dulce et Decorum Est” for pre-teens. READ 2013 * Artemis Fowl by Eoin Colfer. Lively, amoral, wildly imaginative debut (six more followed) about the money-grabbing master-criminal Artemis, 12. The author called it “Die Hard with fairies”. * The Silver Sword by Ian Serraillier. Inspiring wartime story of the Balicki family in Warsaw. READ * Animal Farm by George Orwell. Smart 11-year-olds won’t need any pre-knowledge of Marx, Lenin, Trotsky and 1917 to appreciate this brilliantly-told fable. READ 2013 * Skellig by David Almond. Brings magical realism to working-class North-east England. * Red Cherry Red by Jackie Kay. A book of poems that reaches deep into our hidden thoughts but also talks in a joyous voice exploring the everyday. * Talkin Turkeys by Benjamin Zephaniah. A book of poems that demands to be read aloud, performed and thought about. * Greek myths by Geraldine McCaughrean. Superheroes battle with demons, gods intervene in our pleasures and fears – a bit like the spectres in our minds going through daily life, really – beautifully retold here. * People Might Hear You by Robin Klein. A profound, suspenseful story about sects, freedom and the rights of all young people – especially girls. * Noughts and Crosses by Malorie Blackman. A book that dared to go where no one thought you could with young audiences because it raises tough stuff to do with race. * Einstein’s Underpants and How They Saved the World by Anthony McGowan. A crazy adventure set amongst the kids you don’t want to know but who this book makes you really, really care about. * After the First Death by Robert Cormier. Cormier is never afraid of handling how the personal meets the political all within the framework of a thriller. * The London Eye Mystery by Siobhan Dowd. A book that allows difference to be part of the plot and not a point in itself. * Beano Annual. A cornucopia of nutty, bad, silly ideas, tricks, situations and plots. This list originally appeared on my personal blog, Try It and You May. Some people have difficulty accepting input on their creative works, especially creative writing. I think they worry that if they incorporate someone else’s idea, the work isn’t their own. But I really love getting creative writing ideas from people, especially children, mine or anyone else’s kids. People new to writing often say, “I shared this story with my kids and they loved it!” Unfortunately that phrase smacks of amateurism. It’s great that your kids love it, but your kids also love you and kids can’t often separate their feelings for a person from something the person creates. Most adults can’t even do that! So while it’s great to ask kids for their opinions and creative writing ideas, it takes time to learn when their advice is valuable. So while I refrain from mentioning if my kids like something I’ve written, I’m pretty shameless about working with my kids for brainstorming and inspiration. They have some great creative writing ideas. But I don’t stop there. I use other people’s kids, too. 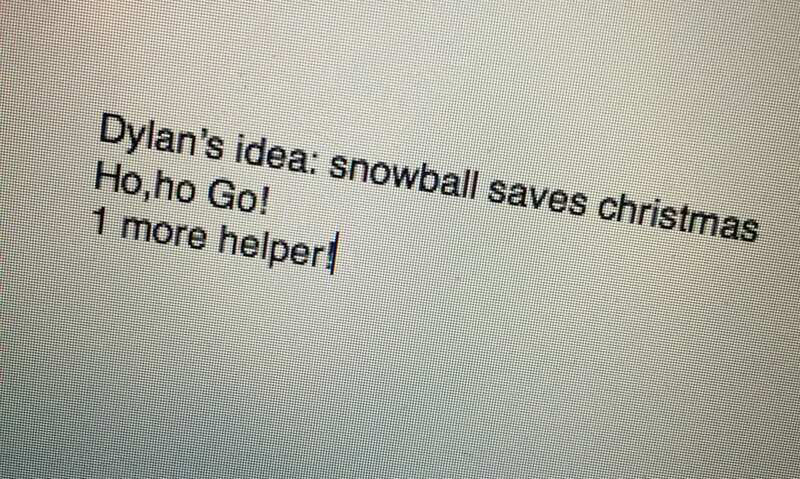 Just yesterday I called a friend’s third grade son and he really solved an obstacle I had in my app idea. Recently my middle son had a friend over and they kept shouting “Ho, Ho, Ho, oh no!” That phrase sparked a story in my brain about either a clumsy Santa Claus, or a not-so-helpful assistant to Santa. Over dinner I shared my ideas with the boys and we decided to write a story about Santa’s new puppy who gets into all sorts of trouble. I like Snowball and Blizzard. 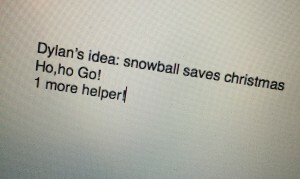 My kids really got into the story development process. 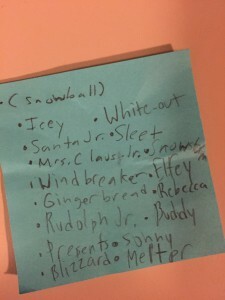 My fourth grader brainstormed character names for the puppy. He did this on his own, without me asking. I love that he knows I will listen to his ideas and that he cares enough about my writing to contribute and make it stronger. I also love how he knows not all of these ideas will work. 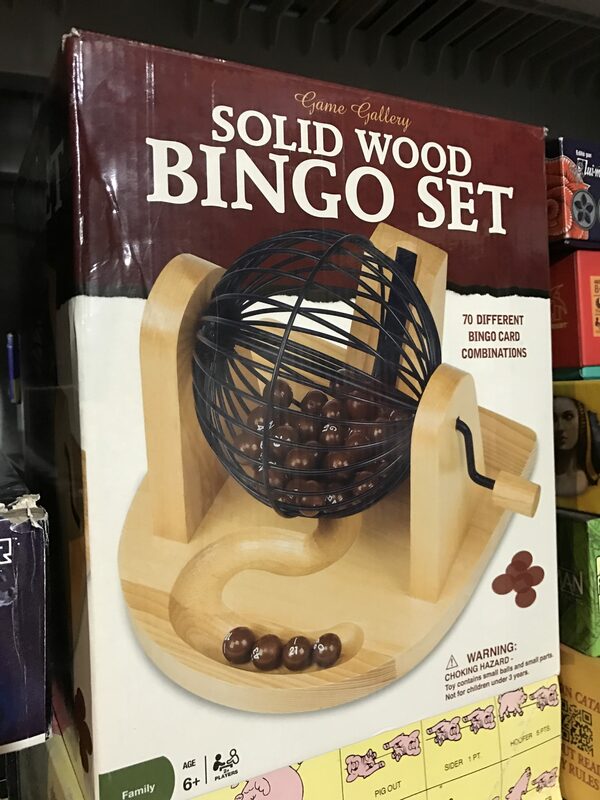 That’s a big concept for a young kid. Good titles are hard for me. Not only did my middle son and his off hand comment turn into a creative writing prompt, he suggested alternative titles. I was calling the story “Santa’s Best Friend” but I really like “One More Helper.” Titles are so hard for me but titles and cover images sell books and stories. I love how he suggested more than one alternative title. 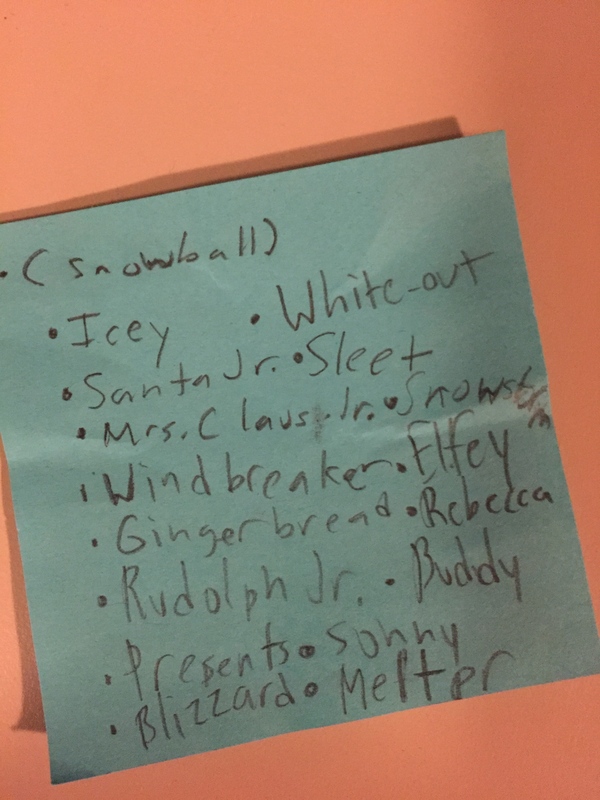 The boys also suggested topics for other stories. They are little generators of creative writing ideas. The middle one wanted to read about an apple seed, so that became “Root Camp.” And again, the middle one wanted something about salt and pepper, so I am in the process of writing a kid’s mystery about which seasoning pushed pepper out of the spice cabinet. The older son gives me great critique on my middle grade work. He tells me if he understands the dialogue and if it sounds real or not. He also tells me what doesn’t make sense to him when I describe action. He’s doing a lot of text analysis in class right now and his critique skills have definitely improved. I don’t ever mention to editors or agents how my children feel about my work, but that doesn’t mean I’m not asking them. I value their input and their ideas. But I also involve them in the creative process and share my struggles and confusion with them. I let them know when I’m stumped and if they help me figure out a missing piece of the story, or fix that line that doesn’t rhyme in my story about dinosaurs rocking out I give them full credit. It can take awhile for a child to learn that not all of their ideas will be used. And it can also take awhile for people to accept input on their creative works. But it can be so effective to get outside input. In this Publishers Weekly podcast, author Holly Black described how she develops some of her works by sharing rough drafts and general ideas with her critique group. Her process sounded really familiar to me and really validated my ideas that getting input can make a better final product. Are there certain people you trust when it comes to contributing creative writing ideas? Are there certain people that you never listen to? 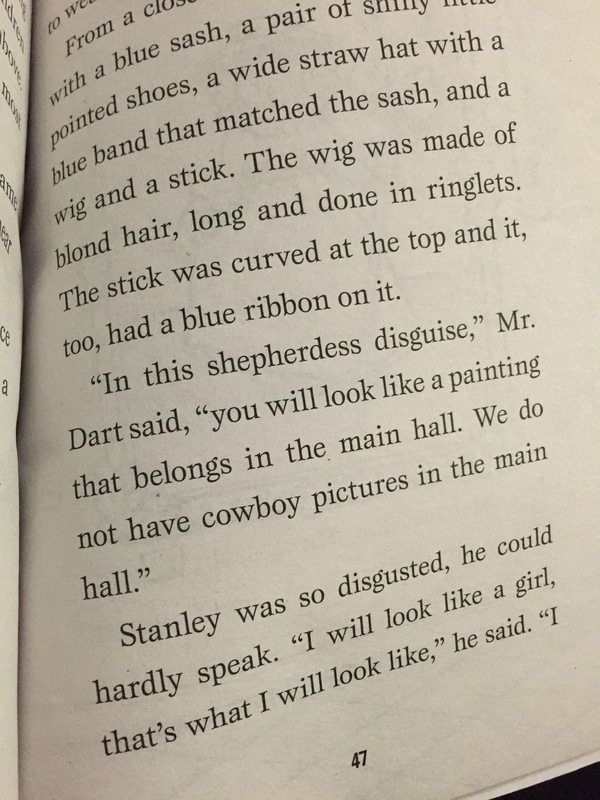 I read a lot of children’s books but lately I’ve been really angry to discover so much sexism in them. My second grader is now reading chapter books but he still wants me or my husband to read with him, so I get to check out of a lot of books I’ve never read before. One of our favorite series is Junie B. Jones. We found the Ready Freddy books to be enjoyable but a little too repetitive. But recently I’ve had two very unpleasant discoveries of sexism in some popular chapter book series. I stopped reading here and had a conversation with my son about it. I asked him what he thought about it, and he said Stanley should just wear the costume to trick people. I explained gently that it hurt my feelings for someone to think it was disgusting to dress like a girl. In this case, I hoped to build the notion that all politics is local in my son, so he could realize sexist statements like this have implications for people he loves. 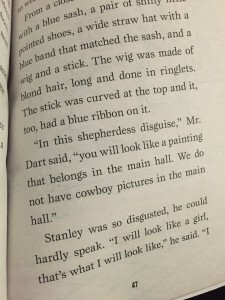 It really bothers me that my son read about a character, the hero specifically, who thinks it’s disgusting to dress like a girl. 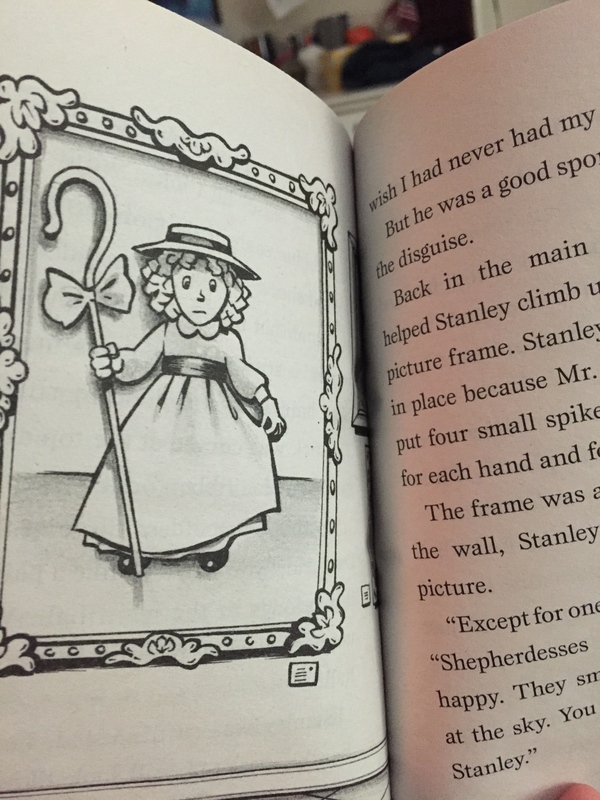 The Flat Stanley books feature a little boy who becomes flat and uses his flatness to help people. And his parents are unfailingly polite. But this is a pretty rude sentiment to indicate it’s disgusting for a boy to dress like a girl. It’s pretty culturally insensitive, too. While it may the reality that boys find it disgusting in our culture to dress like girls, what that does is reveal the underlying belief that girls represent something boys should not admire or want to look like. That being a girl, looking like a girl, is undesirable. But it’s ok for girls to wear pants like boys, wear sports uniforms like boys, and be called tomboys because it’s ok for girls to emulate someone with more power in our social system. But according to this passage you’d have to be an idiot to want to dress down the social power ladder. This message is subtle but persistent. Kids are reading it and believing it. 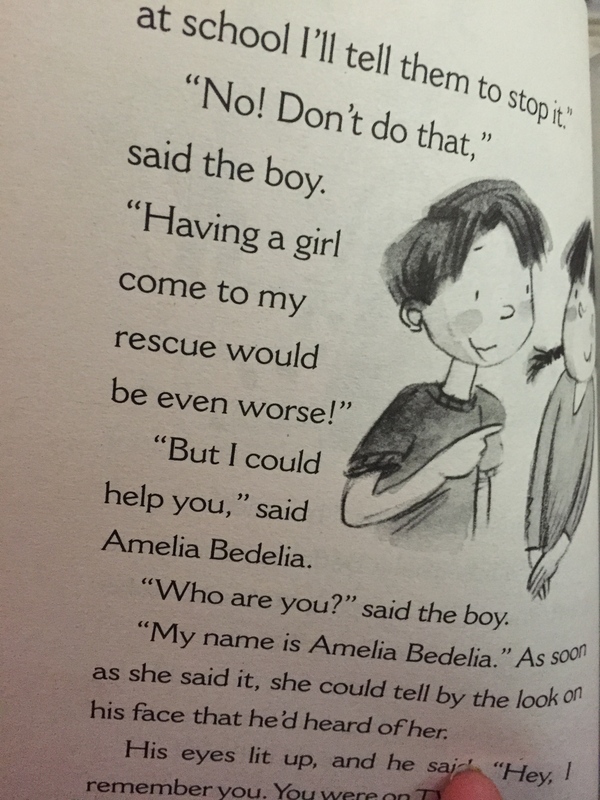 A similar sentiment is repeated in one of the newer chapter book versions of the Amelia Bedelia stories. I know the power dynamics are different when the kid is seven and he’s thinking about his mom. But reading this sentence indicates that boys should not let girls help them at school, because that’s proving he’s so weak, so incapable of protecting himself from bullies (who were mocking his purebred prize-winning poodle), he’s reaching up to girls for help. This statement from the author is based on the assumption that girls are weak and less powerful, and implies that getting a girl’s help means this character even weaker than girls. It made me sick. I’m getting rid of both books. I’m all for freedom of speech and I’m super against censoring and banning books. But that doesn’t mean I have to allow my children to read these books. It also means I’m ready to have this conversation with my kids whenever they encounter any kind of racist or sexist or discriminatory language in books. It’s scary to think of our kids as objects of ridicule if they attempt to challenge sexism. But it’s scarier to me to think of my boys adopting sexist beliefs and then acting on them as adults. I urge you to look for ways that books perpetuate sexism and have the conversations we need to have with our kids to change this inaccurate power dynamic. And I urge you to challenge your own thinking and look for ways you could be continuing these stereotypes. Talk to your children about sexism (and racism, and all kinds of discrimination) and be part of the change. Do you send thank you notes? Have you ever forgotten to send a thank you note? I volunteered at our elementary school this month helping with an assembly and the launch of a new school activity, Kids of STEEL. Kids who join this program will get to run together once a week and learn about healthy eating. 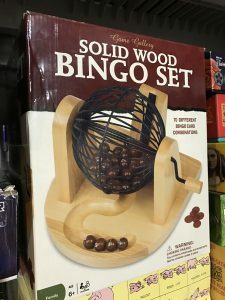 It’s right up my alley. But after the assembly ended, our PTO president and principal realized they had forgotten to unroll the giant thank you sign they had created for these kinds of events. “There’s just so much going on,” lamented our PTO president. We discussed photographing the large thank you sign and creating custom thank you cards. The principal is taking the idea to the teacher who advises student government, and I am hopeful they will give it a try. The PTO can still write notes or send emails, but I think involving the kids has so many benefits. Writing thank you notes as a kid is almost as important eating healthy and exercises. 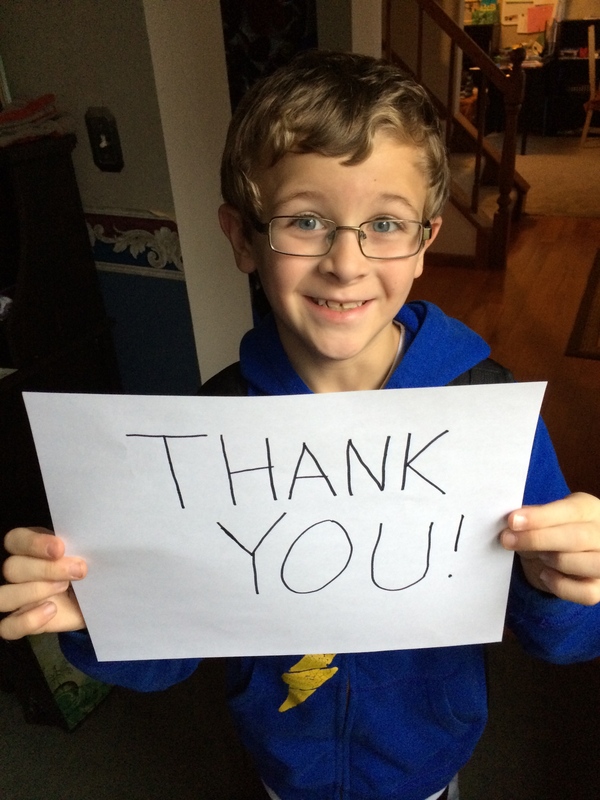 Writing thank you notes is a physical, active way to help my children develop a strong sense of gratitude. I know that feeling gratitude can go a long way toward helping a child feel happy and satisfied in whatever path they follow in life. I recently finished local Pittsburgh author Britt Reints’ book An Amateur’s Guide to the Pursuit of Happiness. Reints dedicates an entire chapter to the science of gratitude. She cites research that argues when we feel and express gratitude, we are happier. She also emphasizes that gratitude is not the same as feeling indebted, and I am working hard to help my children understand the subtle difference there. Working with volunteers gives me many times to feel and share my gratitude. Over the past ten years, I have often found myself struggling to find ways to express my gratitude that matches the value of the gifts these volunteers have shared. I collected a list of the 100 most creative and relevant ways I’ve said thanks to volunteers and these ideas are available to you as an e-book called Thanks! 100 Ways to Appreciate Volunteers. Some families don’t have a habit of writing thank you notes. I often give my grandmother credit for building the habit for me, but really my mom was just as influential. She would often say, “Write the thank you note, or we’ll never hear the end of it from your grandmother.” I guess they had a pretty effective good cop/bad cop system going because even now I say those things to my children. Technology offers lots of ways to say thank you now beyond the traditional handwritten note. And my family has used a variety of them, like the photo at the top of this blog. But we never abandon the thank you note completely. I do agree that the way we say thank you isn’t as important as remembering to do it in the first place. A true, heartfelt “thank you” is all we need to offer. Do you value handwritten note more or less than other ways of showing gratitude? 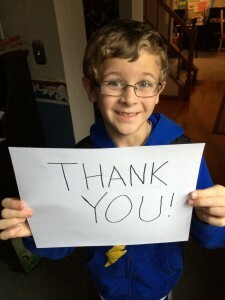 What creative ways you have helped your children – or you have used yourself – to express gratitude? Let’s Move Pittsburgh hosted their first ever Symposium on November 7, 2013 at Phipps Conservatory. 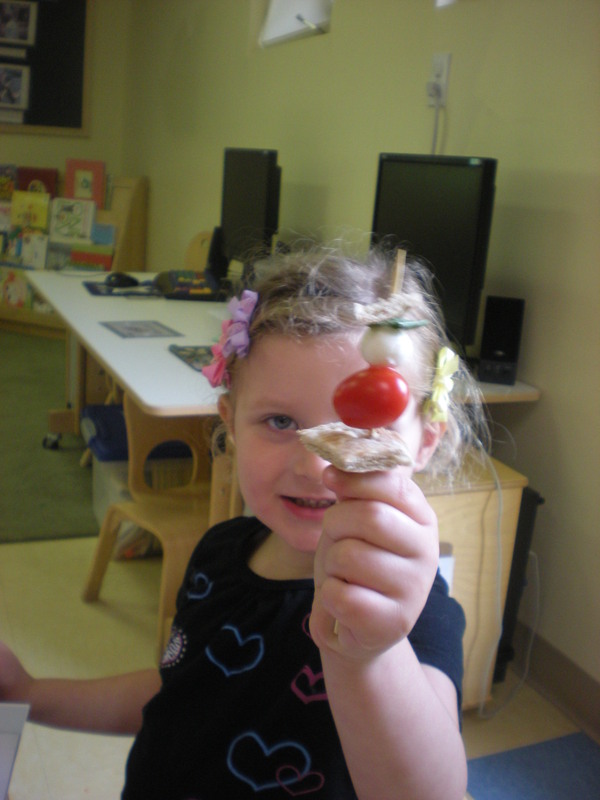 The title was “Making the Healthy Choice the Easy Choice.” I really liked that title because so much research shows that when you give children choices at the grocery store, during preparation and during meals – and those choices are healthy choices – kids will choose good-for-them-food. 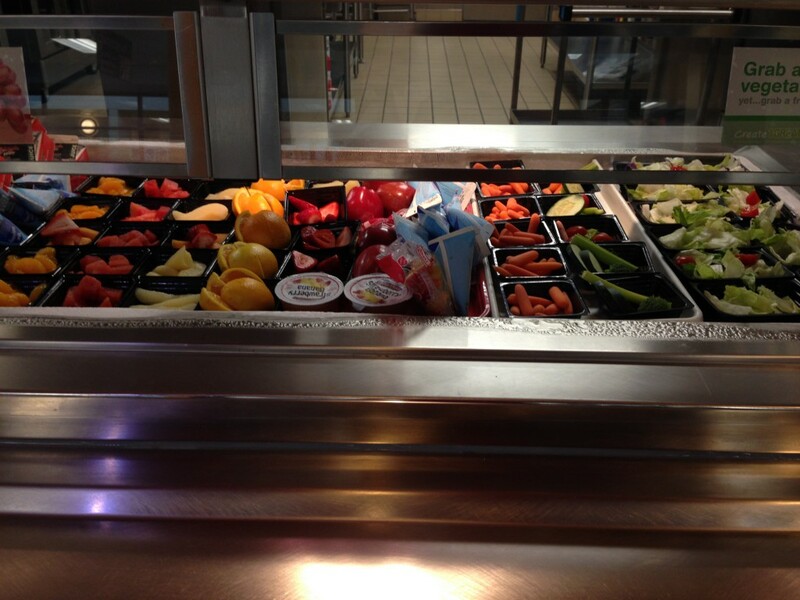 I also learned from Let’s Move that the USDA is rolling out a new Smart Snacks in Schools program. I started thinking about places where I could increase healthy choices for my children, and our wonderful community soccer program came to mind. My boys have played soccer for about two years and I always cringe when they ask to buy Hugs at the snack bar after games. So I started asking people about alternatives at the Symposium. “Instead of Hugs, give the kids their water bottles at the beginning of the season and get them filled up at the snack bar,” suggested Jesse Sharrard, Food Safety and Nutrition Manager from Greater Pittsburgh Community Food Bank. I loved that idea because water is so important for young athletes and getting rid of those Hugs would reduce litter on the soccer fields. But I know the soccer league relies on snack bar sales to fund a lot of the program. And if the snack bar has candy for sale, the kids will ask for that. So I asked parents on Facebook what healthy snacks their children would actually buy. So what are your thoughts? 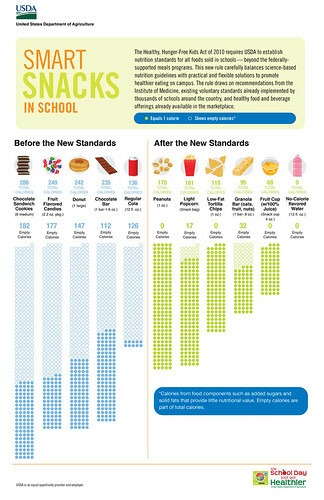 What healthy snacks would your kids buy at school or at concession stands? If you’re planning to write for children, especially early readers, you need to be familiar with sight words. Sight words are a group of several hundred words that make up the majority of words used in children’s literature. New readers need to be able to recognize sight words by sight because many of them cannot be deciphered using phonics. Pretty confusing for a young kid but also essential if they want to be successful readers. Teachers and editors know these sight words – but, aspiring children’s writer – do you? 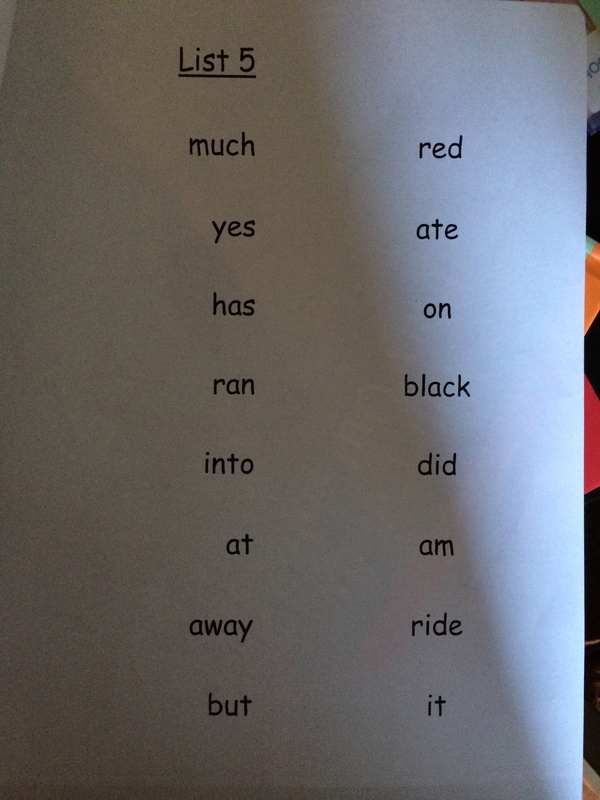 There are tons of resources online for writers who want to gain familiarity with sight words. I’m pretty lucky because I have a first grader! We are working through five books this year, each with five lists of words that my young reader will master before the end of the school year. Can I brag a little and mention he’s already completed the first two books and is ahead of schedule? Helping him master sight words includes very common techniques that we use to learn new things every day: repetition, frequent exposure, and in his case, a relaxed approach to the process of learning the words. 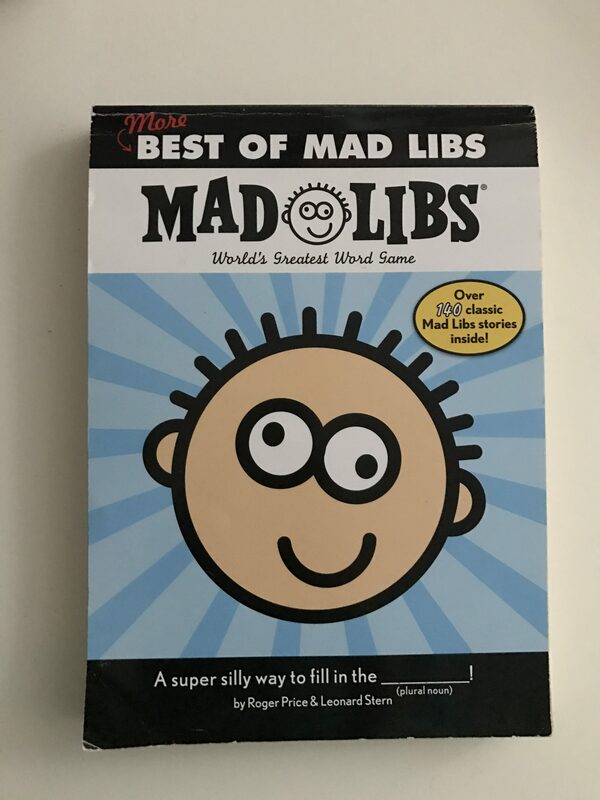 Research shows that children learn these sight words best when working in small groups with adults, so I’m also a volunteer in the classroom helping other children master their sight words. I flip over index cards and gauge how fluently the children read the words. There’s so much more to writing for children than just picking a high interest topic like dinosaurs or princess fairies. Word choice can make a story just the right level of challenging for a young reader and very useful to a teacher. When I’m working on a children’s story that I plan to submit to a magazine, agent or publishing house, I return to these lists. I look for places where I can substitute adult words for a sight words. Lists of sight words are available online.